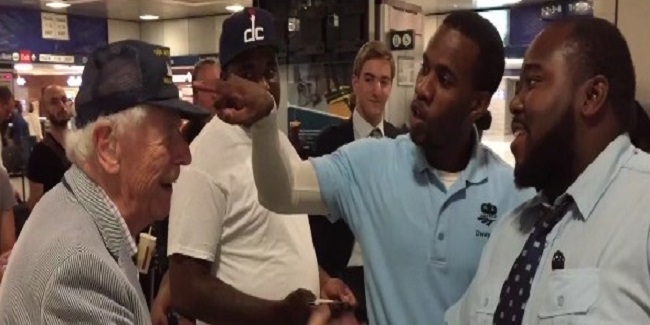 Visiting Penn Station, New York, this 99-year-old World War II veteran was received in a startling way! A young Amtrak worker spotted his hat, and realized what it revealed about the man wearing it. He rushed up to the veteran and repeatedly said ‘thank you’ to the man, shaking his hand and calling over fellow employees to tell them, even shouting to the line that this man was a veteran. He took the man’s hand and brought him to the front of the long line, and no one objected. The worker then started an enthusiastic applause, proclaiming that this man’s sacrifice made it possible to live the life he currently lives. The worker then escorted the man to his train and made sure that he was able to board first. My son is always afraid, that’s why he printed this,” the man said as he pointed to a large, laminated note that was attached to his belt, containing his identification and his son’s contact information in case he ever became lost and needed assistance. His son will be proud to see the warm reception that his father received at the station, and the bystanders were honored to witness the reaction.